A variety of pests can plague a peach tree and it is a rare peach tree that is not attacked by some kind of insect during its lifetime. Identifying the insect and understanding its life cycle will help you select the safest and most effective insecticide to rid your peach tree of the pest. In some cases you may be able to choose between organic and inorganic insecticides. Dormant insecticides--sometimes sprays, other times oils--are those that are applied in the late winter or early spring when the peach tree is still dormant. These are used to prevent insect problems that emerge with bud break in the early spring, making it difficult for the insect to either hold on or to eat the treated tree and its parts. Spray insecticides used later in the season are applied with pump sprayers and either treat infestations already present or deter infestations from occurring. Organic insecticides offer options to chemical treatments. Mites or scales that were present the previous year warrant a treatment with dormant oil in the spring before the buds begin swelling as that is when the new generation will be emerging. 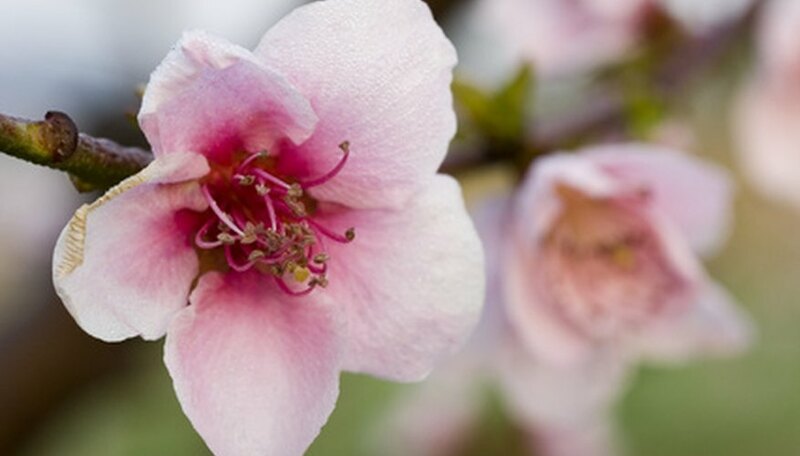 Once the petals have fallen, it is safe to use other insecticides to treat for aphids, peach borers, caterpillars, plum curculio and the oriental fruit moth. These will attack the tree at different times, which is why a schedule of spraying should be followed. Applying dormant oil or spray should be done before emerging buds swell. Any later is not effective as the type of insects it treats will have already had an opportunity to gain a foothold. Chemical insecticides such as Imidan, captan or thiophanate-methyl are applied during the blooming phase of the tree either at bud break or at petal fall. Captan or thiophanate-methyl can be reapplied several times throughout the growing season, first at shuck split, again 10 days later and then repeated in early June and early July. Great care should be taken during blossom time to protect pollinators such as bees. There are some organic or botanical products available to use as insecticides, though most are not as effective as their chemical counterparts. The main difference is they do not contaminate the fruit in any way whereas chemical products can taint the fruit. Azadirachtin works for seven to 10 days and is effective against codling moths and oriental fruit moths. Capsaicin or hot pepper wax is reportedly useful in treating aphids, mites and a variety of other pests. Mating disruption is another method that uses insect pheromones to lure insects away from plants such as peach trees. The University of Virginia claims it is effective in controlling oriental fruit moths and peach borers. Applying insecticides at the wrong time can render them ineffective or harm helpful insects such as bees. Using a product that does not treat the insect attacking the tree is a waste of time and money and leaves the tree at risk. Many insecticides leave a residue that can be toxic for humans, especially small children. The buildup of pesticides in large-scale orchards can also be harmful to harvesting workers who must handle the fruit.